Shredded chicken recipes are so versatile. You can make a simple shredded chicken recipe and then use it in all of these delicious dishes! So many shredded chicken recipes… so much time savings! Make your shredded chicken ahead of time and use it in some of the best recipes all week long. Or make a big batch of shredded chicken and freeze for later use. 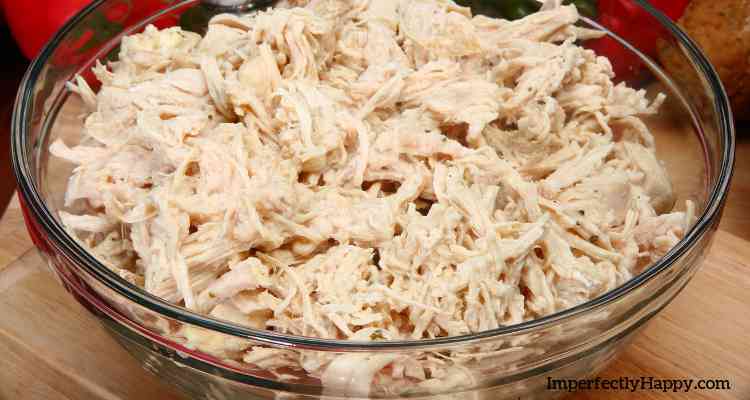 If I have the time I like to make my shredded chicken base in a slower cooker or crock pot. I find this makes the shredded chicken the most moist and tender. You can really use any chicken to do this but I do find it is faster to use boneless cuts of chicken (usually breast or thighs). Put your chicken meat in the crock pot. Add the broth of your choice or water. Cover and cook on low for 6 – 8 hours for best results. You can also cook on high for 3 – 4 hours if you need them faster. Shred and use in your favorite shredded chicken recipes. You can make a fast and delicious shredded chicken in your Instant Pot too. I love that I can make a big batch of shredded chicken in a fraction of the time of the crock pot; so if I forget to start the slower cooker in the morning the Instant Pot will still rescue dinner! Not to mention I can make frozen chicken in the Instant Pot FAST! Put all of your ingredients in the Instant Pot. Secure the lid and make sure the vent is in the sealed position. If you’re cooking fresh chicken you’ll set the Instant Pot to Poultry, High Pressure for 6 minutes. If you’re cooking frozen chicken you’ll set the Instant Pot to Poultry, High Pressure for 11 minutes. Once cooking is completed allow a natural release for 5 – 6 minutes and then do a quick release for the rest of the pressure. Remove your chicken from the pot, reserve a 1/2 of the liquid if you want a more moist shredded chicken. If you prefer you can make your shredded chicken on the stove top as well. This method isn’t as hands-off as the slow cooker or Instant Pot but you’ll still get great results. In your large pot add the chicken and liquad making sure the meat is entirely covered. Bring it to a boil and then reduce the heat to a simmer for 8 – 10 minutes (chicken juices should run clear if fully cooked). Drain the lidquid and your chicken is ready for shredding. There are several ways you can shred your chicken! The 2 Fork Method – Using 2 forks you simply pull them across the meat in opposite directions. Continue this process until the chicken is completely shredded to a consistency that works for your recipes. Shredding Claws – Shredding claws are made specifically for shredding meat after cooking. The same principle as the 2 fork method but much faster and more efficient way of getting it down. The shredding claw are inexpensive, don’t require electricity and work well. The Hand Mixer Method – Once I tried shredding chicken with a hand mixer I never used the 2 fork method again. This takes a fraction of the time and energy! Break up the chicken meat with your hands or a knife and place it in a large mixing bowl. You don’t have to break up the meat but I find less flies out of the bowl if you do. Put the hand mixer in and turn on low. Watch the magic happen in just seconds! If you have a stand mixer you can use that too with the paddle attachment. Shredded chicken can be made ahead of time for these awesome recipes. Make your chicken, shred and store in the refrigerator in a zip lock bag or vacuum sealed bag (my preference) for 3 – 4 days and can be stored in the freezer for up to 9 months. Thaw frozen shredded chicken in the fridge overnight. In a pinch you can use shredded chicken from a can in these recipes. I don’t find this to be the most cost effective choice and to me the flavor isn’t as good as home cooked chicken. But if you’re covering it with a sauce or using it in a casserole it should work just fine. Make sure to drain all the liquid out before using it! I like to simply take my pre-cooked shredded chicken and toss it with a 1/2 jar of my favorite salsa, heat low to medium on the stove top then add the remaining salsa before serving. Add to your taco shells and top with cheese, sour cream, guacamole and lettuce. Delicious and couldn’t be easier. The fastest way to make a pulled chicken sandwich is to take your warm shredded chicken and add a jar of your favorite bbq sauce. You might want to warm up the bbq sauce a bit too before tossing with the meat. 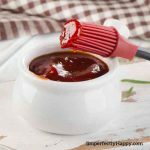 But if you have time, make this fast homemade bbq sauce for your pulled chicken sandwiches! Whisk all the ingredients together in a large saucepan over medium heat. Allow it to come to a bubble but not a hard boil. Reduce your heat to a low simmer and let it cook until it thickens (10-15 mintues). Use immediately or store in a mason jar in the refrigerator for up to 7 days. Another fantastic way to use your shredded chicken is in a chicken salad. This is perfect for leftover chicken from the fridge! Here are some of my personal favorites! Who doesn’t love a great chicken casserole? Use your pre-made shredded chicken in these recipes for a quick and delicious dinner! You can take a couple cans of cream of mush room soup, heated, with shredded chicken, pour over pre-made rice and bake for 30 minutes for the fastest casserole ever! No matter how you decided to use your shredded chicken, it is a great make-ahead option for many recipes and meals. How do you like to use shredded chicken? Be sure to check out my other Instant Pot Recipes, Crock Pot Recipes and Roasted Chicken Thighs Recipe!